Earlier this year, Mercedes launched the all-new E-Class, in long wheel base format. At that time though, the company only introduced the petrol E200 and the top spec diesel, the E350. Now, the company has unveiled the lower spec of the diesel, the E220 LWB. The E220 is powered by a 2.0 liter in-line 4 cylinder engine that produces 194 Bhp and 400 Nm. This takes the vehicle from 0-100 in 7.8 seconds and has a top speed of 240 kmph. The engine is mated to the company’s all-new 9G tronic gearbox and comes equipped with the Dynamic Drive Select which enables the driver to choose between Eco, Comfort, Sport, Sport+ and Individual. This changes the characteristics of the engine, transmission and the ESP. What makes this engine special is the fact that it marks the debut of the company’s all-new OM654 engine in the Indian market. Till now, the E220 was powered by a 2.1 liter engine, however this one goes below the 2,000 cc mark. In order to use this engine here, the company has had to introduce Electronic Torqueing for the first time in the engine assembly for the E220. The vehicle will be locally produced in the company’s Pune facilty. The car comes fitted with LED headlamps and tail lamps, panoramic sun roof, 17″ alloys, 64 colour ambient lighting, touch sensitive controls on the steering wheel, electric sunblind for the rear windows, 37 degree reclining rear seat, chauffeur package with memory function, Command online, a new touch pad for controling the central infotainment screen (12.3″), Apple Car play and Android auto, Parking pilot with active parking assist and 7 airbags. 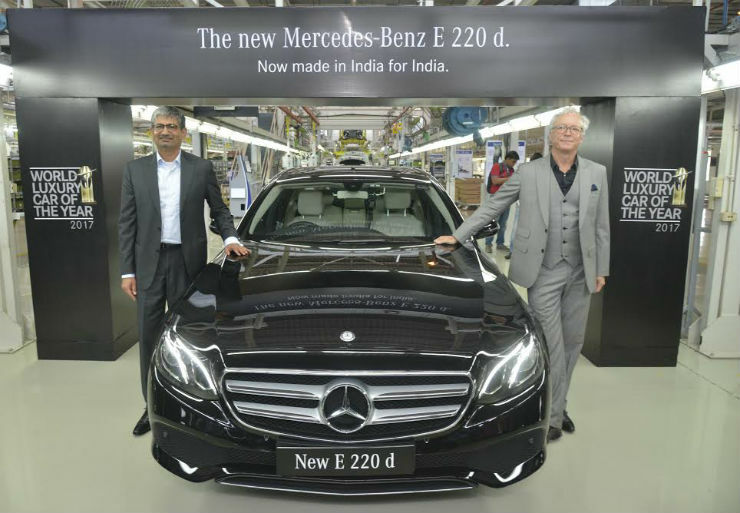 The company has priced the E220 at Rs 57.14 lakhs, ex-showroom Pune. The E200 petrol is priced at Rs 58.70 lakhs and the top spec E350d is priced at Rs 72.62 lakhs ex-showroom Pune, which makes this the cheapest E Class on sale in the country.